Thromboelastography (TEG®) measures the mechanical properties of a developing blood clot. 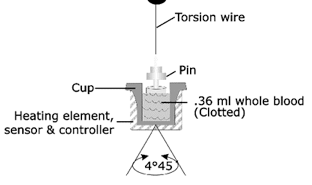 An aliquot of citrated blood is pipetted into a sample cup, and a stationary pin attached to a torsion wire is immersed in the blood. The sample cup oscillates back and forth constantly at a set speed. When fibrin and platelet aggregates form, they connect the inner wall of the cup with the pin, causing the pin to oscillate in phase with the clot. The magnitude of pin motion is directly proportional to the strength of the clot. Lysis or retraction of the clot diminishes transfer of cup motion to the pin. Pin motion is converted by a transducer to an electrical signal which can be monitored by a computer. This information is displayed graphically as a tracing. R - Reaction time is the time that elapses between placing blood in the sample cup and formation of the first measurable clot. The time of the first measurable clot has been designated as the time required for the TEG tracing to reach an amplitude of 2 mm. R-time is prolonged by coagulation factor deficiencies and anticoagulant medications, such as heparin, and is shortened by hypercoagulable conditions. K – K time is the elapsed time from the beginning of clot formation until a fixed level of clot strength is detected as defined by an amplitude of 20 mm. This parameter is a measure of the speed at which a clot achieves this level of strength or firmness. Elevated fibrinogen levels, and to a lesser extent, hyperactive platelets shorten K. Fibrinogen deficiency prolongs K.
Alpha Angle (?) – Alpha angle is the slope of the TEG tracing drawn between the R and K values. It reflects the speed of fibrin accumulation and polymerization and is closely related to K-time. Alpha angle is decreased by fibrinogen deficiency and anticoagulants. MA – Maximum Amplitude is the highest vertical amplitude of the TEG tracing and is an indication of platelet function. MA is similar to PFA-100 platelet function and aggregation studies. Thrombocytopenia and abnormal platelet function will decrease MA. LY30 – LY30 measures the rate of amplitude reduction 30 minutes after the MA is reached. It represents the degree of fibrinolysis and breakdown of the clot during this time interval. Fibrinolysis increases the value of LY30, while the use of antifibrinolytic agents, such as Amicar, will shorten it. Reference ranges for each of these parameters using citrated blood are summarized in Table 1. TEG parameters can be used to guide transfusion therapy during surgery. Suggested blood component therapy for each abnormal parameter is summarized in Table 2. Transplantation.” In: Spiess BD, Counts RB, Gould SA. Perioperative Transfusion Medicine 1998. 3. Kang YG. “[Thrombelastograph® Analysis] in Liver Transplantation.” Seminars in Thrombosis and Hemostasis Vol 21 Suppl 4, 1995. 4. Kang YG, Martin DJ, Marquez J, Lewis JH, Bontempo FA, Shaw BW, Starzl TE, Winter PM. "Intraoperative Changes in Blood Coagulation and [Thrombelastograph®] Monitoring in Liver Transplantation." Anesth Analg 64:888-896, 1985.